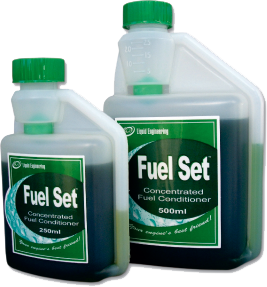 Fuel Set is a complete, concentrated fuel conditioner with extensive benefits. Below is a list of the uses that Fuel Set can give. This handy dosing bottle measures up to 25ml at a time (treating up to 100L of fuel with each measure). The perfect size for all small commercial and domestic uses - 500ml treats a 2000L domestic oil tank, and the larger measuring dose accommodates tanks on larger vehicles such as vans and executive cars, as well as boats. Removes water and cleans throughout the combustion process. Reduces / eliminates black smoke and smoother running improves performance.